Elvis Enthusiasts Unite: Today's high point? What issit, dear viewer? 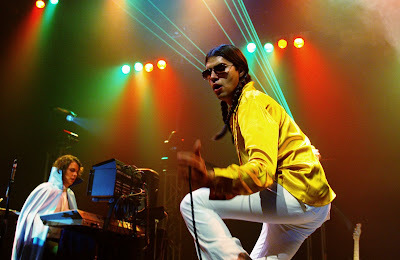 Discovering that Austin's Ghostland Observatory is coming to my wee spot on the map on May 29. First time ever? It's gotta be. It's sorta ironic, too, considering the band's song "Midnight Voyage" has been a staple of my radio show for over a year now ... and the duo is coming on the same night of the week that I'm usually trying to sell Utah Valley on their unique brand of electro originality. I best get my sub DJ right now, cause I won't be missing this. Never thought I'd get so excited to see a guy in a cape banging on a piano and a braided singer writhing all over the stage while squawking up a storm, but I'm giddy. I ain't a very pretty dancer, but I shall boogie and Roger Rabbit myself into a sweaty mess that night. No questions about it. Wanna come with? Tix go on sale tomorrow via 24tix. Clickety-click HERE after 10 tomorrow morn. Oh my gosh, pee my pants, YES! They were very much a highlight of my Sasquatch experience last year - not that you need any convincing. Oh, but others do ... others always do. Thanks much for your vote of confidence in the right direction. After reading this. I looked them up on U Tube. Yummy. The boys got mooooves.